Proprietor and winemaker Guy Davis and I go way back. I have tasted every Pinot Noir Guy has crafted over the past ten vintages, and he has shown me the ability to capture the complex aromas and flavors, the silky textures, and the essence of Russian River Valley terroir. The perfect Pinot Noir has not been produced yet, but some of Guy’s ephemeral Pinot Noirs have come darn close. In the last couple of years, I have gotten to know Guy’s son, Cole, who has become increasingly involved in the winery’s winemaking. I recently visited the Davis Family Vineyards tasting room in Healdsburg, and although Guy was vacationing over Valentine’s Day with his wife in Paris, Cole was able to lead me through a tasting of the 2010 vintage Pinot Noir wines. 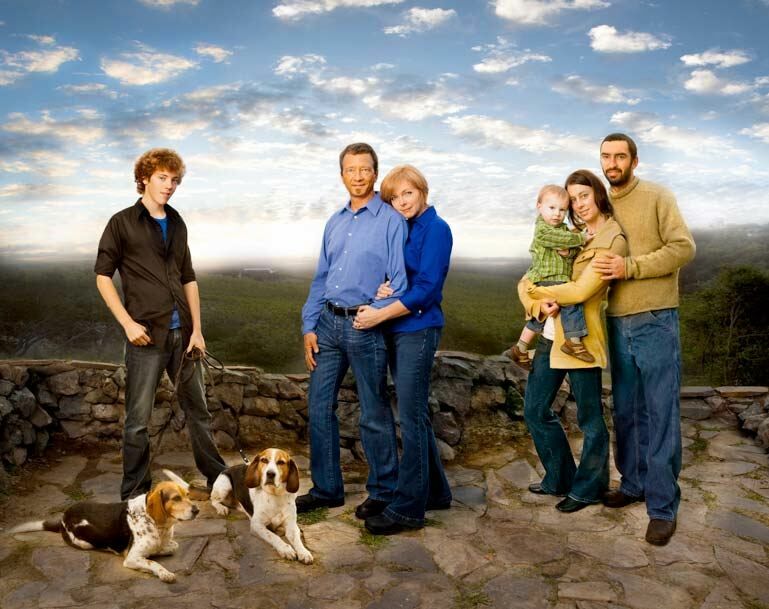 The Davis family is pictured below with Guy and family in the center and Cole and family to the right. Guy farms 7 acres of Pinot Noir on a vineyard adjacent his home on Laguna Road in the Russian River Valley which provides the fruit for the Russian River Valley, Soul Patch and Pinnacle Pinot Noir bottlings. He also produces vineyard-designated Pinot Noir from Starr Ridge and Horseshoe Bend vineyards, both in the Russian River Valley. Guy is a talented winemaker who makes many varietals besides Pinot Noir all of which are top notch, and even crafts an olive oil. The 2010 vintage Pinot Noirs are nearly sold out. Robert Parker rated them very highly and the wines flew out the door. Forty percent of the 2010 crop was lost due to the weather, with Soul Patch ending up with the largest production. Some wines are reserved for Wine Club members. 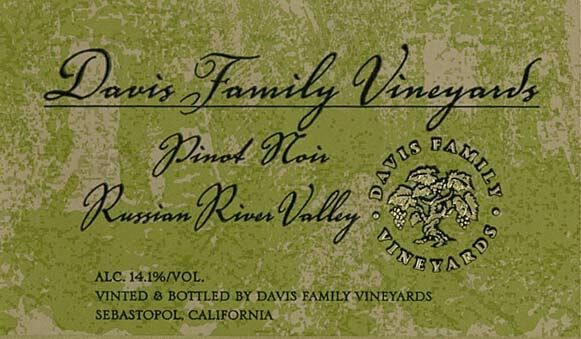 Visit the website at www.daviswines.com for information and availability or contact Annie Rambo at 866-338-9463. The wines are made from low-yielding vineyards, 100% de-stemmed, and generally aged in 33% new, 33% 1- year, and 30% 2-year-old French oak barrels. Why buy these wines? If you are a fan of Russian River Valley Pinot Noir, you can’t find any better examples anywhere. Year in and year out, the wines are stellar. Family owned by warm, classy people. 14.1% alc., $40 (sold out). A blend of four vineyards. · Moderately light reddish-purple color in the glass. Bright aromas of Bing cherries and spice with optimum fruit ripeness. Vivid middleweight flavors of cherry cola, rhubarb and spice supported by soft tannins. The least layered wine in the lineup, but very appealing for current drinking. Good (+). 14.1% alc., $50. A favorite barrel selection from the estate vineyard planted by Guy Davis in 1996 featuring Dijon and Pommard clones planted in Goldridge soil in the Laguna Ridge area. · Moderately light reddish color in the glass. Intense cherry perfume with complimentary notes of oak and allspice. Delicate and lighter in this vintage, but with good intensity of flavor, featuring a core of cherry fruit underlain with cinnamon and cardamom spice, and cola. Very supple tannins and appealing upfront drink ability. Very good. 14.1% alc., $50. A ridge top cool vineyard above the town of Occidental at 1000 feet above the fog banks of the Russian River Valley below. The coolest and most coastal of the three Davis vineyard designates. · Moderately light reddish-purple color in the glass. Savory on the nose and palate featuring blueberry, dark cherries and purple berries. Relatively elegant and light in weight, with an amazing finish of flamboyant black cherry fruit. Wow! Exceptional. 14.1% alc., $50. Owned by the Baker family of Thomas George Estates, this is the warmest of Davis’ sites. · Moderately light reddish-purple hue in the glass. The nose is a little fruity and a little savory. Elegant and charming on the palate with flavors of fresh black cherries, raspberries and baking spices. Juicy, with good acidity and gossamer tannins. A seamless wine of impeccable breeding. Very good. A special barrel selection only made in certain vintages (2007 was the last vintage). The wine spends more time, 14-15 months, in barrel untouched and takes on more oak. Cole calls it “Soul Patch times 2.” · Deep reddish-purple color in the glass. A full-bodied wine with explosive aromas of black plum, black cherry, blackberry, cola and spice mirrored in the flavor profile. Firm, but not aggressive tannins. My experience with this wine is that it benefits from decanting, but I only had a glimpse after Cole was kind enough to open a bottle. Very good. Special note. I received a notice from Annie Rambo on February 22, 2013, that the 2012 vintage wines are being offered for ordering as futures through the second weekend in March with a 25% discount. The 2012 Estate Pinot Noir, Soul Patch, 2012 Starr Ridge, and 2012 Horseshoe Bend Pinot Noir wines are available ( and Estate Chardonnay, Old Vine Zinfandel and Estate Syrah). 6 bottle minimum. E-mail Annie at annie@daviswines.com or call 866-338-9463. You may receive this notice a little late, but contact Annie and tell her the Prince sent you.